Gareth was so excited to get to celebrate Valentine's Day a day early at school this year. As far as he was concerned, the 13th was Valentine's Day. 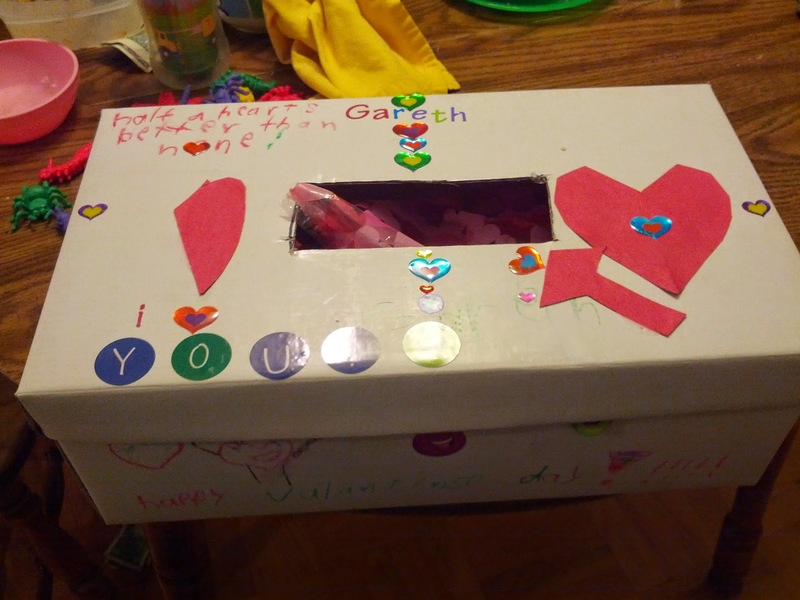 He took in all his cards (we still have a few to give to friends not in his class) and his decorated shoe box. I love that he's old enough that I can give him scissors, glue, and various supplies and he can do his decorating all on his own. We dropped him off at school and then headed off on our Mercer Island ride. I was feeling more tired than I liked before we even made it to the island. Got to ride across the I-90 bridge, which was kind of cool. Lots of wind, and my chain dropped partway across. I wasn't quick enough to think to shift back up to get the chain back on, so had to stop and put it back on. But later in the ride when it dropped again I did remember and was very proud of myself for not having to stop. Anyway, the island itself wasn't too bad. Hilly, but you can usually use the momentum of the downhills to get up the uphills. Gorgeous views of Mount Rainier and Lake Washington. Lots of houses way bigger than I'm accustomed to seeing (our response to things we can't afford is usually, "We don't live on Mercer Island!"). We didn't stop for pictures though, and I'm honestly not sure a phone picture could have done the views justice anyway. Malcolm stayed happy as a clam for all 4.5 hours of riding (well, most of it), eating snacks I'd brought and the Valentine's sugar cookies our friend had brought. He took a brief nap as we were leaving the island. I made it all 43 miles, but was very hungry (we should have stopped for lunch, but didn't) and tired and sore. An hour later we had to head back out to pick up Gareth. We stayed to play at the playground for an hour or so so that Malcolm could have a chance to be out of the trailer, enjoy the nice weather, and get some energy out. I love winter here. We've got daffodils, crocuses and even some hyacinths out. Many trees are starting to bloom. In February! Gareth ate a ridiculous amount of candy after school and some other kid took pity on Malcolm and gave him a lollipop from his stash. The kids were more than happy that my exhaustion meant pizza for dinner. And they got to open a Valentine's package from Gram. Our actual Valentine's day was incredibly low-key. I went to my clarinet lesson. Ryan went to his drum lesson. I went to the anatomy lab to attempt memorization of bones/bone markings. Because I got home close to dinner time the kids got scrambled eggs for dinner (which they're always thrilled to get). Gareth got to stay up late while waiting for us to make dinner for ourselves so that we could watch Dr. Who with him.